This very wide self-adhesive magnetic tape helps to attach heavy non-magnetic objects to metal surfaces. For example, you can attach a piece on the backside of a plastic or aluminium sign to hang it up securely on a ferromagnetic surface. The magnetic tape is available in lengths of 1 m, 5 m, and 25 m. It consists of strontium ferrite and flexible plastic. On one side it is coated with an adhesive. The adhesive force is 102 g/cm2. The longer the magnetic tape the higher the adhesive force. For heavy objects, we recommend a large enough magnetic tape. The self-adhesive magnetic tapes are not a suitable surface for magnets. They would demagnetise the tapes. A better surface for magnets would be our magnetic boards and ledges. 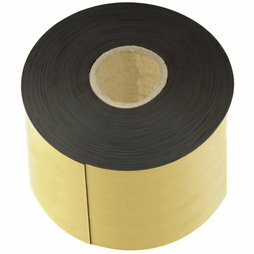 Attention: 5 metres of this tape weigh almost 4 kg - 25 weigh over 20 kg!